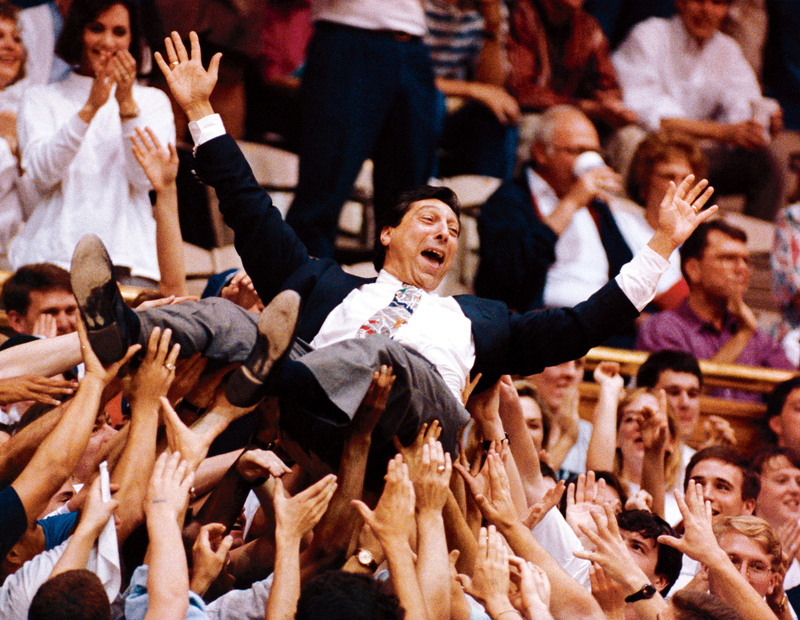 Recently I watched my favorite sports documentary: Survive and Advance, the tale of N.C. State University's inspiring NCAA basketball championship run in 1983 and Coach Jim Valvano's fight against cancer. I'm always moved by the story of his legendary 1993 speech at ESPN's ESPY awards, where Valvano, despite having "tumors all over my body," despite vomiting throughout the flight to the event, despite needing assistance to reach the podium, outlined his emotional and spiritual philosophy for life. "There are three things we all should do--every day!," he declared. "Number one is laugh--you should laugh every day. Number two is think--you should spend some time in thought. And number three is, you should have your emotions moved to tears--it could be happiness or joy. But think about it: If you laugh, you think, and you cry, that's a full day. That's a heckuva day." Like many people who have seen the speech, that passage stayed with me. I certainly laugh every day. I certainly spend time in thought. But it's rare that my emotions are moved to tears. As a kid, I remember hearing the song "It's All Right to Cry" from the Free to Be You and Me album and wanting to wretch. Years later, I saw the movie Terms of Endearment and the entire audience was weeping. Except me. I looked around the theater and thought... Am I the only one not crying? Is something wrong with me? Do I have defective tear ducts? But Valvano's larger point, I believe, is that we should revel in the microscopic joys of life, which often escape us amidst distractions and obligations. And so on a recent trip to Lucerne, where I attended a conference, I escaped to a bench and watched two happy toddlers throw gravel into the lake. I spent evenings with two sponsors--old friends from Ireland--who make me laugh, and keep me out too late, and lead me to drink more beer than I really need. It's about wrenching ourselves from headphones and screens, and immersing ourselves in the world rather than shutting it out. It's about feeling something basic and essentially human. I confess: When I watched the documentary again, I laughed. And I thought. And I cried. If you want to do the same--or if you just like basketball--you can find Survive and Advance here. Go to the 1:24:00 mark to hear the story of the ESPY awards speech, which Valvano gave less than two months before his death at 47. And if you really want to shed a tear, and to hear a man in the macho world of big-time college sports talk about, yes, love, go to the 1:59:10 mark to see his final moment with his team at a 10-year reunion in 1993, three years after he was fired by the university. Grab some tissue. And then, since National Cancer Survivor Day is June 5, make a donation to the V Foundation for Cancer Research. Ken Budd is the host of 650,000 Hours, a web series launching in 2016. You can follow 650,000 Hours on Twitter and Facebook. Ken is the author of the award-winning memoir The Voluntourist and his writing credits include The New York Times, National Geographic, Smithsonian, The Washington Post, and The Chicago Tribune. This post also appears on 650000Hours.com.